HIS NAME IS FEATURED ON THE LIST OF THE MOST PROMISING WINE PRODUCERS IN THE WORLD. His name is featured on the list of the most promising wine producers in the world and he has taken over a winery with great history since 1840. In his 29 years, Kostis Dalamaras belongs to the "gang" of extremely talented young winemakers who are changing the image of Naoussa by redefining the wine of the region. How do you think that your studies and experience abroad affected the traditional vinification of Xinomavro? My studies gave me the theoretical basis to know ,scientifically, what it was that my father and my grandparents did for so many years, empirically. My work and travels in various wine regions of Europe allowed me to meet many different wine styles and the way they are made. So I gained knowledge that helped me to adapt easily in difficult situations and have the ability to identify our weaknesses. I do not think I can talk about anything in particular ,that I have changed. Many things have changed but everything is details, so the detail is what makes the difference then! What is the typical character of Xinomavro and how much does it have to agree with the modern versions of Xinomavro? I believe that when we talk about Xinomavro we’re talking about aromatic finesse, acidity and tannins. At some point we confused the aromatic finesse with the monotony of "tomato sense" ,the elegance that acidity gives in Mediterranean wines with the sharp acidity and the good tannic structure that gives richness and strength in time with the dry tannic finish. 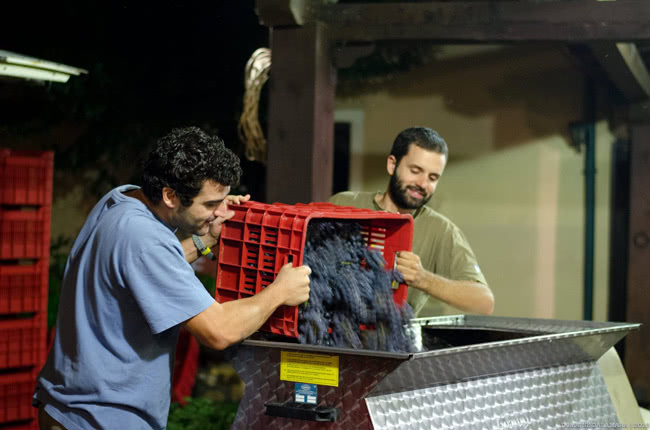 The new generation of winemakers in the area of ​​Naoussa, just come to redefine all these by not making a terrible overthrow or using an innovative-modern method but by managing Xinomavro as simple as possible. The "modern" Xinomavro wines maintain all the dynamic of the variety but also they are more “accessible”to consumers even at a younger age than we had used in the past decades. Many question us if these versions of Xinomavro that we are making now, will have durance in time. Personally I believe that they will age even better than before. The fact that tannins are more mature and acidity is more in tune with the whole set does not reduce the strength of a wine over time. Many argue that Xinomavro resembles Nebbiolo or Pinot Noir. Do you agree? Yes, it is something that we hear constantly and even ourselves used many times as a tool to describe more easily Xinomavro to wine lovers abroad when they first came in contact with it. Now we have begun to avoid it, because we aim that Xinomavro will define itself as a very special and particular variety. Definitely, it is not a coincidence that something like this it is said. Regarding good tannic structure and strength in time we are very close with Nebbiolo and some dynamic Pinot Noirs, as those from Coted'or. From another perspective, there are certainly differences in their aromatic bouquets, but one can find similarities when the wines age and begin to acquire earthy notes like truffle in Nebbiolo or forest’s leaf aromas -the so called sous bois - in Pinot Noir. So perhaps their main similarity is their relationship with time. All these varieties take time to unfold all the magic of nature and excite the consumer. How do you feel about your distinction among the 30 most promising wine producers in the world? I was definitely excited at first, but soon I realized that I must prove myself in deeds so I focused and went into business. It is certainly a very good incentive to always strive for the best and to justify those who chose to put you on this list. This is perhaps the biggest gain from this whole story, the motivation to always succeed a little bit more! Tell us about the legendary Triadique 2007!